This charming lighting accent is ready for the candle of your choice, and you can hang it up or set it on your tabletop. Open the door to place a candle inside to soak in the cheery radiance. Measures 5¼" x 4½" x 8¼" high; 10½" high with handle on top. 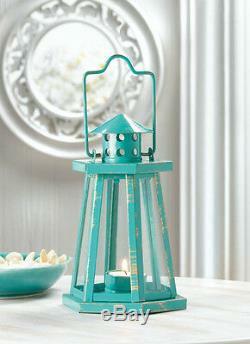 The item "10 TEAL peacock blue LIGHTHOUSE candle holder lantern wedding table centerpiece" is in sale since Saturday, January 23, 2016.